Hello Beth, the one we have in our case is $5520. and is a finger size 7. If we needed to make a new one in another finger size, the price might be different. 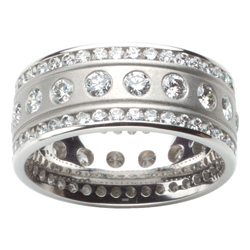 We also have the same style ring with diamonds only half the way around the ring. Do you want to come in and see if the one we have fits you? Or we can find out your finger size and check the current price. We hope to see you or hear from you soon. How are you celebrating life today?